Scribbled Angelfish is considered an ideal pet as addition to your marine saltwater tank because of their docile nature. 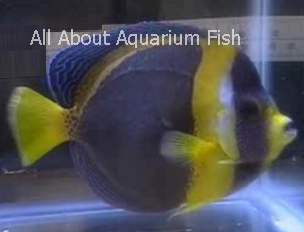 Similar like the other angelfish species such as the queen, emperor and dwarf yellow angelfish, they are also regarded as one of the most beautiful saltwater species. Scribbled angelfish is unique in such a way that their have strong blend and combination of blue plus yellow colors that form a similar pattern with the yellow band running along the front gill and another between the top fin and body (insert picture). Captive breeding of scribbled angelfish has been reported before but it has not been carried out in large scale involving fish farming due to the complexity of pairing them up together. The species that you saw sold in pet stores are mostly caught around the areas close to the Great Barrier Reef in Western Australia and then exported to different countries, as this is much more economical approach. The fish is generally accepted as a good community aquarium fish species and it’s very unusual that they will turn aggressive towards other tank mates. A full grown adult size can usually reach almost 10 inches in length and a recommended tank capacity to accommodate them should be at least 80 gallons and above. And because they are docile species that will take time to adjust themselves to new aquarium, I would suggest putting up aquarium background to cover the tank sides so that they won’t get startled easily. Just like their close angelfish relative, scribbled angelfish also love to eat algae and sponges including other small invertebrates. To keep them healthy, make sure that the live foods such as krill are quarantined before you add in to the fish tank. Avoid buying and then putting the fish to an aquarium, which haven’t been fully cycled and condition such as cloudy aquarium can cause grievous harm to your pet. It is always a good idea to get some aquarium test kit, which can give accurate measurement of water condition and make the necessary water adjustment like doing saltwater change immediately when you detect problems. A healthy scribbled angelfish specimen can cost you anywhere between $200 to $500 depending on size and it’s up to you to put up your best effort to take care and ensure that they get what they deserve. If you like to know more about other related angelfish genus, I suggest you check out The Centropyge. Also have you ever thought of having a unique aquarium? Check out why corner aquarium is one of the most popular choices among fish owners.